Fire Projects relay on Ravel for conventional fire alarm panel. The RE-2554/8 is a 4/8 zone UL Listed Conventional Fire Alarm control Panel. These control panels are designed to be used in small & medium commercial industries, buildings, hotels, schools, etc. and are compatible with conventional detectors, manual call points and normally open dry contact devices. Fire projects recommend Ravel RE-2554/8 conventional fire alarm control panel which has been designed to comply NFPA-72 guideline and other local codes. Fire alarm control panel is self-contained with integral power supply and space provision for two sealed lead-acid standby batteries. Ravel fire alarm control panel control function with microprocessor and test and isolate functions are included. It enable repeater function of panel status output. RE-2554/8 has optional function of RS 485 communication facilities along with lamp test and walk test. Fire Projects has succesfully programmed Ravel Re-2554/8 for NAC's, IDC's, Trouble reminder, Earth fault annuciation, Supervisory mode with alarm verification facility. 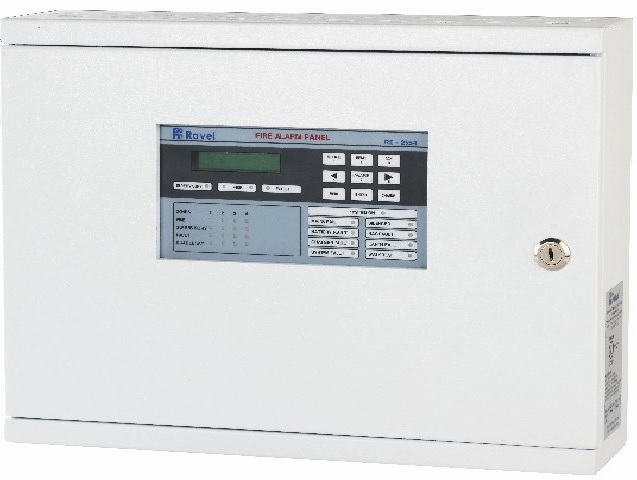 Conventional Ravel RE-2554/8 fire alarm control panel installed by fire projects, receive information/signal from field devices called smoke detector, heat detector, beam detector, ultra violet flame detector for fire detection and fire alarm control panel start giving alarming. Conventional Ravel RE-2554/8 fire alarm control panel required local power supply and it provide electrical energy to field devices as well as signaling devices called manual call point and sounder, hooter or sounder with flash. We support our clients from Designing up to Commissioning to AMC. We also provide AMC–Annual Maintenance Contracts for all types of Fire & security Systems. If you required new installation or AMC of fire alarm system, contact Fire Projects today! • Over All current consumption is low. • Fully complies with UL -864 and NFPA-72. • Rugged CRCA sheet with powder coated finish. • Operates on 110 - 220v 50 /60 Hz, AC Mains power supply. • 16x2 Dot Matrix LCD Display. • 4/8 Class B Style ‘B ‘ or Style ’C’ initiating device circuit (IDC). • Standby Power 24V D.C (2 Nos of 12v, 12Ah Sealed Lead acid battery).